A Gionee soldier has cleared the TENAA certification website, and we couldn’t be prouder. 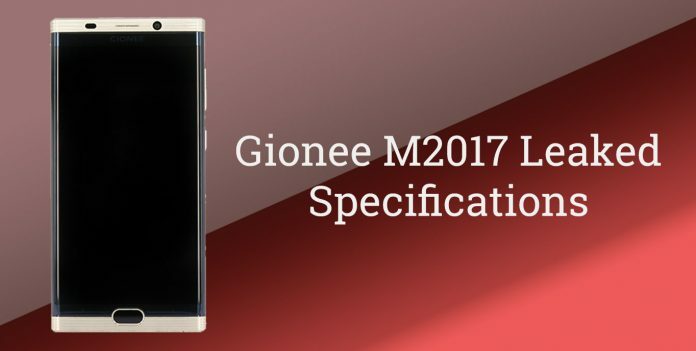 Gionee M2017 smartphone has been certified and has come up with some amazing specs and magnificent design. Gionee M2017 or Gionee M (2017) has a 5.7-inch screen. The display type is AMOLED, and the resolution is 1440 x 2560 pixels. The design is impeccably beautiful and carries the same legacy of Gionee design to greater heights. The phone has a 12MP + 13MP dual setup primary camera accompanied with an 8MP front-facing camera for selfies and video chats. Images in Gionee phones have always been raw and real, and this one won’t disappoint you either. As far as performance is concerned, this Gionee gem has some high-end features. It is powered by a Snapdragon 653 chipset and an octa-core processor which is clocked at 1.95GHz. The GPU is Adreno 510. The phone has 6GB RAM and an internal storage of 128GB, but no microSD slot is present on the phone. The most magnificent feature of the phone is it’s battery, which is as humongous as we can think of. The phone has a whopping 7000mAh battery which will metaphorically make us forget our charger. The phone also comes with premium features like fingerprint sensors, NFC, USB Type-C port, dual camera setup, etc. The TENAA certification has revealed a few but useful specs in determining the future of the phone. The phone is a high-end substitute for anyone shooting for Apple and Samsung. The phone will be available in black colour. Anyone looking for a never-ending battery and efficient working, this is your one big chance. We will keep you updated as soon as more information is released about Gionee M2017, till then stay tuned with us.